The Recycling Center located at 2022 Wagner in Vandalia is open, licensed and has been made fully accessible and appropriate for our programs. Of course, it is fully compliant with all laws and codes. Let us demonstrate how we can save costs for your company! Recycling In Fayette and Bond Counties Will Not Be Successful Without You! 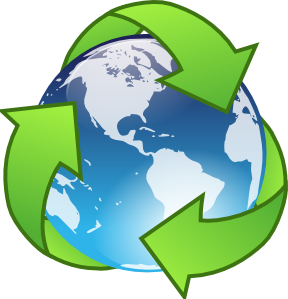 RECYCLE - Take the challenge - Put a tote or box next to your desk at work, your computer area at home, in your kitchen, or in your garage. People are more likely to recycle if they have a reminder and they will continue to recycle once they see the volume they collect and the difference it makes. VOLUNTEER - We are very interested in working with individuals who would be willing to volunteer their time in a number of areas. Create a recycling initiative in your home or at your workplace and volunteer to help collect and deliver material to the drop-off bins. Please remember - Recycling is not trash collecting! Make sure that all of your containers are clean but you do not have to remove the label. Put items in the correct bins. NEWSPAPER MATERIAL - All inserts in newspapers are considered part of the newspaper material. Phone books are also considered newspaper. MAGAZINES, CATALOGS, BOOKS OF ALL SORTS - Any size will be accepted; textbooks, paperback books, etc are OK.
OFFICE PAPER - copier paper, shredded paper, junk mail and envelopes, manila envelopes and file folders - any size, any color paper. 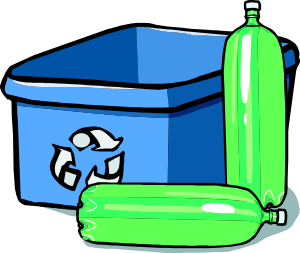 PLASTIC CONTAINERS - Only plastic containers with a recycle symbol and number are recyclable. (Ziploc baggies, bread sacks, etc. are not recyclable. Styrofoam is not accepted even though it may have a recycle symbol.) Please make sure all items are rinsed out but you don't have to remove the label and we can take the lid too. Plastic grocery bags should be returned to the store, please. CARDBOARD - This includes corrugated boxes, cereal boxes, paper bags, and brown paper packaging. Please flatten your boxes to allow more room at the collection site. ALUMINUM CANS - Please make sure they are rinsed out and crush them if you can to allow for more room at the collection site. But no foil or foil food trays. STEEL/TIN CANS - Please make sure they are rinsed out and crush them if you can to allow more room at the collection site. You do not have to remove labels. We do not accept plastic grocery-type bags. Please return them to the store.